The natural beauty of the Florida Keys has been luring vacationers for years with it’s breathtakingly picturesque tropical islands. The crystal-clear waters also offer amazing snorkeling opportunities. 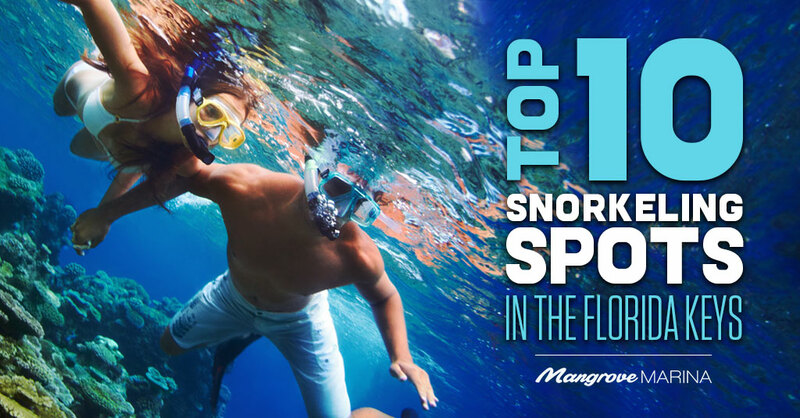 Here are the top ten spots for snorkeling in the Keys. Located in Key West, where you can bird-watch, learn about history, visit a real fort, hike through nature trails, and, best of all, enjoy some of the best snorkeling in the Keys. Seventy miles off the coast of Key West is the Dry Tortugas National Park, where you can snorkel in the beautiful waters around the fort during the day, as well as enjoy the nighttime underwater habitat. Enjoy Key Largo snorkeling in the first underwater park in the country, with over seventy square miles of marine life and coastlines. There’s even an old shipwreck to explore along with guided tours and excursions. An 18th century Spanish ship, Ignacio, sunk off the coast of Key Colony Beach. It’s a four mile jaunt by boat to get there, and well worth the effort, with a seemingly untouched oasis of stunning marine life. Located in the Biscayne National Park, you’ll find this haven of diverse sea-life. It’s only accessible by boat, but once you’re there, you can explore the breathtaking waters of the Pacific Ocean as well as ancient shipwrecks. A short ferry ride from Islamorada is this beautiful spot, with waters as shallow as four feet, around an old lighthouse, where you can bask in an underwater paradise. Explore some of the great barrier reefs off the coast of Marathon. Over 30 acres of marine wildlife awaits with the water so shallow, it’s barely above your ankles. You’ll find this breathtaking campsite on Big Pine Key, just steps away from shallow crystal-clear waters abundant with marine life. It’s the perfect Florida Keys snorkeling spot for beginners and children. Home of the Christ of the Abyss statue, placed 25 feet underwater in 1965, this Key Largo snorkeling spot is a must-see. The bronze statue reaches towards the heavens, surrounded by the vivid tropical habitat. Reaching depths of over 100 feet, this snorkeling haven delivers for the adventurous-at-heart. Here’s where you’ll find some of the larger species of marine life alongside the magnificent coral reefs. Now, imagine waking up every morning of your next Florida Keys snorkeling adventure in your own private houseboat? You can’t get much closer to the water than that. Mangrove Marina offers a luxurious selection of gorgeous houseboat villas, just an hour away from the hustle-and-bustle of the main road, situated on over 20 acres of waterfront tranquility. Check our houseboats availability today!